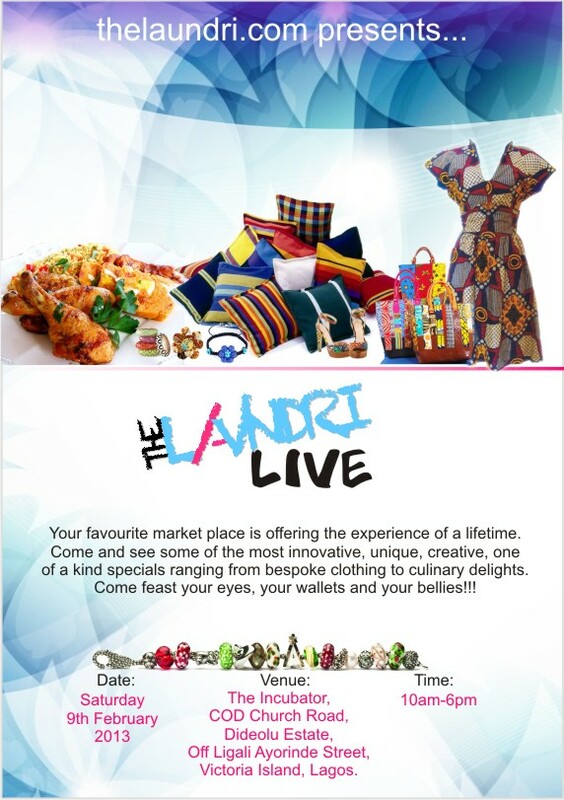 The Laundri Live is a one day, all day market-style exhibition. 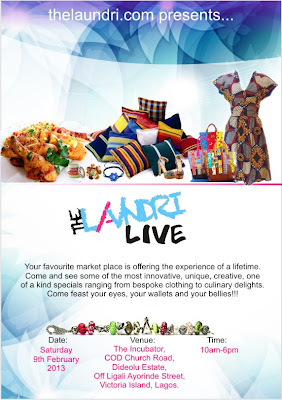 The event will showcase a diverse array of innovative and creative products and services ranging from food to fashion to gifts and a whole lot in between. There will be a food court offering up exquisite sensually satisfying delicacies. The event will hold at The Incubator on City of David road, off Ligali Ayorunde in Victoria Island Tomorrow, 9th of February, 2013 from 10am. The venue boasts excellent parking facilities and shuttles from the parking grounds as well as live entertainment and Football for the boys (and girls). ...hmmm, sounds interesting. I must surely be there. Mhmm...another way to spend my small change. Is it a trade-fair or some kind of event for amusement? NO GATE FEE. It's a one stop open and complete market with the best in clothing,shoes, house hold products, gift items e.t.c at the best prices. It is not just a market or galleria but a great spot for your Saturday chill-time with lots of side attractions like football and games to help u relax from the stress of the week. Come, shop and have fun! It's also a great time to spend with your val as the week of love continues offering you great product to share together with your spouse and have fun while at it. Yes now! Come let's go and see wetin dey happen there, joooooo. I hear the finals for football go happen there today. Make we go watch am live there old boy!